There are special considerations for lighting in areas that involve water. Selina Zwolsman explains. It’s not uncommon to see images of pretty pendants dangling over baths in the glossy ‘home’ magazines. 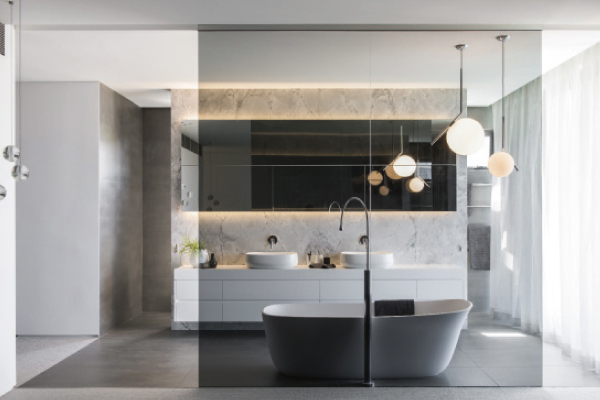 This stems from a growing trend towards master retreats in place of ensuites, and an increased demand for more luxurious bathrooms in everyday dwellings. However, such lavish lights put electricians a little on edge, and there is some clear legislation determining what can and can’t be done in the vicinity of a bath. The Australian and New Zealand Standard AS/NZS 3000:2018 – Electrical installations (known as the Wiring Rules) sets out particular guidelines regarding the selection and installation of light fittings (and other electrical equipment) in bathrooms. This Standard is called up in the National Construction Code (NCC), making it a mandatory set of rules for all licensed electricians. Because of this responsibility for electrical installations, well-informed sparkies will be reluctant to install a fitting that doesn’t comply with the Wiring Rules. The Standard classifies into zones certain spaces in wet areas – and in other rooms housing water containers, such as kitchens with their sinks. The zone classification (Zone 0, 1, 2 or 3) of a space, and its proximity to a vessel of water, determines the type of fitting that may be installed in that area. Fittings are categorised by ingress protection (IP) ratings, and these are defined in another Australian Standard, AS 60529: 2004 – Degrees of protection provided by enclosures (IP Code). An IP rating determines the level of protection from the ingress of solid foreign objects (like dust) and water. The rating is usually written as IP followed by two numbers and, on occasion, an additional letter. The first number, from 1 to 6, designates the degree of protection against solid objects, and protection of persons against access to hazardous parts. The second number, from 1 to 8, denotes the degree of protection against entry of water with harmful effects. If a specific degree of protection is not assigned, an X is used instead of one or both numbers. When an additional letter (from A to D) is used, it represents the degree of protection of persons against access to hazardous parts. Determine the zone in which a light will sit (ie: its position in relation to a bath – AS/NZS 3000:2018 sets out clear diagrams defining the various zones), and the IP rating required. Ask the lighting supplier to provide written confirmation of the IP rating for your selected fitting. Ask the electrician to confirm compliance with AS/NZS 3000:2018 before the light fitting is installed. If your design and selection of fittings don’t meet the guidelines set out in the Standard, you could be facing more than an annoyed tradie. Electricity and water can be a deadly combination, and a non-compliant installation could result in tragedy. The safety of a project should always win out over a lavish-looking space. If for some strange reason the client is prepared to take a risk, remind them that their new home may not receive the required certification if it doesn’t meet the code. In the case of a renovation, be sure to warn the client that the future sale of the renovated home may be halted or canned due to the red-flagging of non-compliance during the building inspection. Need more information (or a short and sweet answer with diagrams)? The Kitchen and Bathroom Designers Institute education partner, Designer Training Australia, has been preparing a super suite of technical bulletins outlining such issues as mentioned above.